Exterior view of the First Lutheran Church at the corner of Old Sauk Road and Pleasant View Road in Middleton, Wisconsin. It was the site of the Middleton Garden Club flower show and the starting point of their country home tour. The church marked its centennial in 1952. 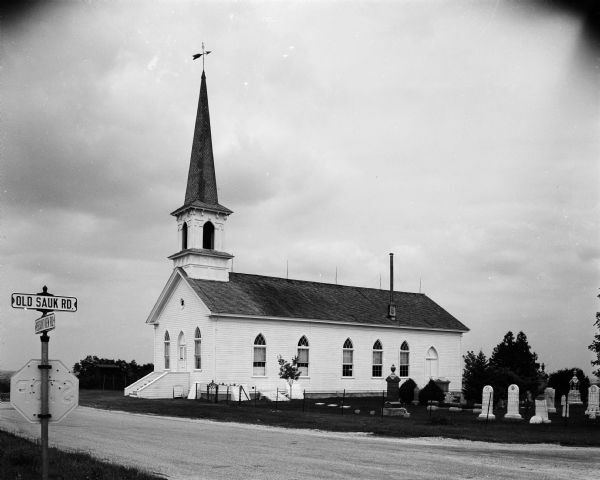 As of 1956, regular Sunday services had been discontinued but an annual reunion service was held each fall. One of two images. Published in Wisconsin State Journal Sept. 5, 1956. Ann Walser schedules events at the church (as of 2012) 608-831-7226.